From what I know – through TED talks and Kurzgesagt and friends, and maybe kinda-sorta my experience in the IT/Tech industries but obviously my job’s not in danger… – the machines are coming to take our jobs and the smarter of us are thinking about how we’ll pay for the groceries once the human function in the workplace has been deprecated. Well, a UBI is a possible answer to that question. Without delving too dangerously into the economics of the thing (because I have no place there), our financial economies today ‘work’ through a cycle of people exchanging their time for money (’employment’), then exchanging that money for things (‘consumerism’). All the while, both the producers of things and the people exchange a cut of whatever money they get to a central entity (‘tax’) that uses that money to provide infrastructural support services to everyone (ideally), through the same exchange of money for things or human-time. 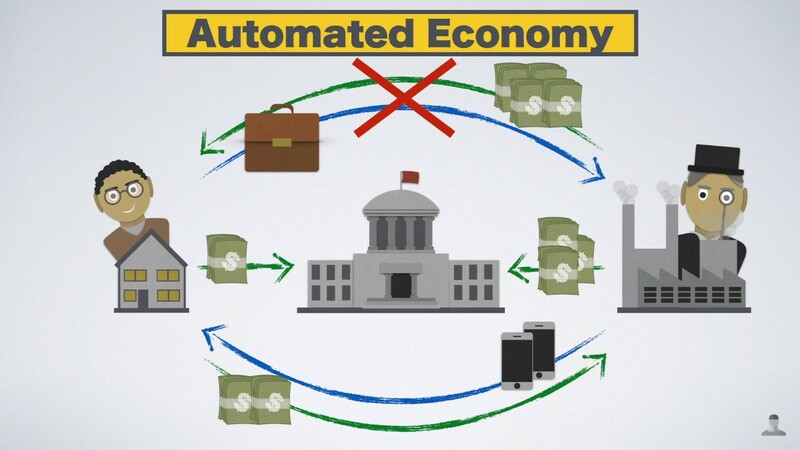 The economy hurtling toward us, the automated one, obviates the part of the cycle where people exchange their time for money (can you guess why?). Without adjustment to the overall model, the result will be less of a cut to the central authority for maintaining infrastructure, and less money to the producers of things, and basically everything just spirals all to hell. The UBI solution boils down to ‘give everyone money, no strings attached.’ A UBI allows for the elimination of the ’employment’ part of that cycle I was talking about, but people can still buy things because, hey, they have money! Usually, the idea is that the government gives them that money, so it would be dumb for them to levy a tax on the people (so naturally they’ll probably still do it), which means less infrastructure-money, but that problem’s fixed by levying a greater tax on the producers (because they’re making money hand-over-fist now that they don’t have to furnish your stupid face with paychecks anymore). Also, ye Central will reap the automation harvest too, so they’ll need less tax money overall (see: no stupid faces). Now that we’ve got that out of the way, this is where my idea comes in: why are we waiting for ye Central to dole out the sweet, free dough? You really should watch that video above, because I’m going to write with the assumption that you have (it’s easier that way). My thinking is that companies can implement a form of UBI for their employees, today. This eliminates one of the very first questions levelled at UBI: ‘how’s the state afford to pay e’erbody anyway?’ Well, initially, the state doesn’t have to. Organisations are edging toward automation already, naturally seeking out every competitive edge they can find. Painfully, the glacial movements of governmental regulation, which should bring about the institutional requirement of a UBI, are too slow to appropriately regulate those groups pushing themselves into the forefront. So those groups should get on with it themselves. They should automate, but do it responsibly. Removing a head through automation? Pay that head a semblance of UBI for the rest of their life, no strings attached. This allows you to get on with putting your organisation forward, without nudging us all closer to economic disaster. And oh-boy am I sure you can spin good PR out of your forward-looking approach! How much, though? How much do you go on paying this redundant meat bag for the rest of their lives? Well, the video mentions a UBI that scales according to ‘automation indices.’ A company could scale their internal UBI in the same way. Imagine a company of 100 employees. Let’s say achieving 100% of this company’s automation potential would see 90 of those 100 employees made redundant. So, if you start with automating one employee’s position – we’ll call them Joe – you’ll have achieved about 1.1% of your automation potential. If Joe made $100 a month, your UBI to Joe could be 1.1% of whatever Joe’s paycheck was at the time of his redundancy (naturally, you should give Joe the standard redundancy package too). So for the rest of their life, you’ll give Joe $1.10 every month. Small? Yes. Maybe you should institute a sane minimum, in addition to that 1.1% or in lieu of reaching some automation potential target. But that’s up to you. Why do this, though? Well, you get to carve your own path forward, and what you pay out in UBI’s will be a pittance compared to what you’ll save as you replace paychecks with electrical bills. You also win people-points and loyalists, by having a pool of ex-employees whom you have furnished with greater privilege than those left to wait for a regulatory, mandated UBI. Tonight at eleven: replicant, or replacement? Personally, were I in charge of these things, I’d take this further by instituting a minimum UBI for everyone in my employ post some date. Resigning? UBI for you. Retiring? UBI for you. Fired? Ideologically (no strings, remember), UBI for you – but, well, that’s a sticky one because people are fired for various reasons. Perhaps tiered UBI levels, going up from fired person, resigning person, redundant person, and finally retiring person? This policy would probably only apply to permanent staff, I suppose. Whatever the case, a company’s rules should be decided before this kind of policy goes live, but I am not sufficiently intimate with the intricacies of firing people to say much more on that. I also think it’d probably be better to continue the “company” UBI, without changes, even after a governmentally-instituted UBI becomes a reality. One might argue this is a kind of double-dipping for your employees, but, well, that might be the reward of loyalty. I mean, the elephant in the room there is that this kind of policy is the kind of thing that engenders a fierce loyalty to your UBI-providing company (future generations may one day be able to attribute a great deal of their privilege to you). If dystopian sci-fi has predicted anything, and the corporate futures portrayed by the likes of Deus Ex, Syndicate, Shadow Run, and others are even in the same ballpark as reality, you might position yourself today for something very, hmm, interesting tomorrow. Or perhaps I get ahead of myself?